A new chapter is set to begin at a commercial anchor in Fairfield's downtown business district, as Fairfield University officials formally announced plans Wednesday to open a new bookstore this fall at the former site of Borders Books and Music. The Fairfield University Bookstore at 1499 Post Road will be a general book retailer that also replaces the existing campus bookstore as the university's main source for textbooks. Scheduled to open in October, the store will sell general-interest books and Fairfield U. merchandise, plus apparel and other branded items for its Fairfield College Preparatory School as well as the town's two public high schools, Fairfield Ludlowe High School and Fairfield Warde High School. University officials said they are also negotiating with an "internationally known" coffeehouse chain to open a 50-seat cafe at the new bookstore, and are in discussions to bring a computer retailer to the store. Since Borders closed its Fairfield store in May, a victim of the national book retailer's bankruptcy filing, the ground floor of 1499 Post Road has been occupied by two interim tenants, Book Warehouse, a book discounter, and the Taj Cafe. 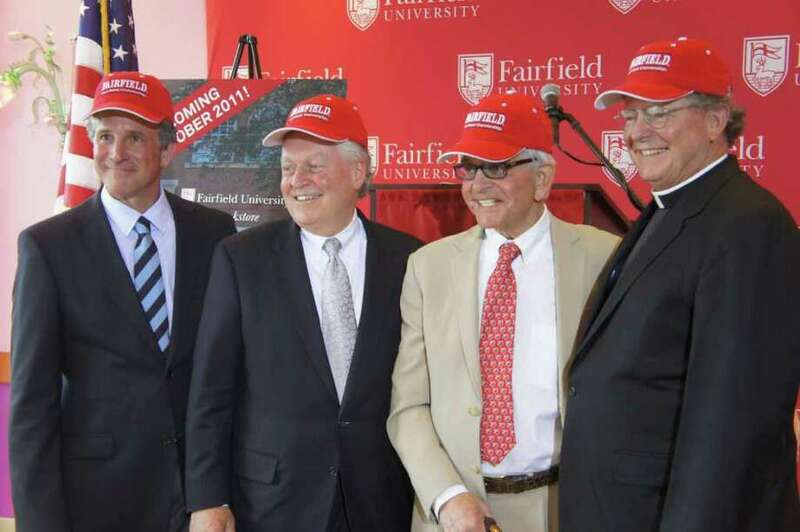 "It is our anticipation that by opening a Fairfield University bookstore downtown, we will bring the intellectual and cultural life of the university more fully into the heart of the greater Fairfield community," said the Rev. Jeffrey von Arx, the university president, at a press conference with the property owner and town officials. The prospect of the new bookstore appeared to ease concerns that the vacant property could prove a drag on the general downtown economy. The property at the busy corner of Post and Reef roads is regarded by town officials and local business leaders as one of the business district's "anchor" retail sites, dating to the days when the Fairfield Store, a family-owned department store did business there for 75 years. But the commercial climate downtown languished after the Fairfield Store closed in 1996, causing a series of smaller shops and businesses to fail until the property was rebuilt and Borders opened in 2001. "I'm thrilled that in this economy that something like this, with the quality tenants that are coming in, is a statement to how well the local commercial community is doing in Fairfield," said interim First Selectman Michael Tetreau. George Szondy, chairman of the Fairfield Chamber of Commerce, also had high hopes for the new bookstore. "This latest venture will not only increase the university's visibility locally, it will also bring more business to all of our other downtown members," he said. Signaling Fairfield University's intent to develop a long-term downtown presence, von Arx added that the new bookstore could also be a venue for lectures by scholars, readings by authors and other cultural events sponsored by the school. "Bookstores, as we all know, are an endangered species," he said. "We need conversations with friends and encounters with ideas that only a good bookstore and a good cup of coffee can facilitate." The university will lease approximately 23,000 square feet for the store from Kleban Holding Co. LLC, whose principal is Al Kleban, founder of the Fairfield-based commercial real estate firm, Kleban Properties. The Kleban family also owns several other key Fairfield Center properties, such as the Brick Walk retail/office complex farther east on the Post Road. "This opportunity is going to inject into Fairfield Center an intellectually stimulating and exciting component," Al Kleban said. "This event is probably one of the most important happenings that this town has ever experienced." The new bookstore will occupy about 12,000 square feet on the ground floor, 3,200 square feet in the basement and about 7,500 square feet on the second floor of 1499 Post Road. Remaining space on the second floor will be leased for office use, Kleban Properties head and Al Kleban's son, Ken, told the Fairfield Citizen. Like the school's existing bookstore on campus, the new retail outlet will be operated by Follett Higher Education Group, which manages more than 900 college and university bookstores across North America. After the downtown store opens, the university will retain a smaller on-campus retail outlet selling school merchandise and possibly a small convenience store. The new downtown store will be modeled on other university bookstores in town centers, such as the Hammes Bookstore and Cafe in South Bend, Ind., near the campus of the University of Notre Dame, said Mark Reed, Fairfield University's vice president for administration and student affairs. While the downtown store is about a mile from the Fairfield U. campus on North Benson Road, Reed told the Fairfield Citizen he feels it will be easily accessible to students. "We have shuttles that run between the campus and the downtown," he said. "We're confident that the students will find their way there." Former First Selectman, Kenneth Flatto, now the executive director of the state Division of Special Revenue, told the Fairfield Citizen in a phone interview Wednesday that he also supports the leasing of the property by the university's bookstore. "This is going to be a first-rate enterprise that will be a cornerstone for Fairfield Center," he said. "This is a key property that I hoped would remain a community gathering place, so I think the concept is great." Flatto, who left office in May, added that he held meetings with Al and Ken Kleban and university officials in April shortly before he stepped down to try to facilitate the university bookstore's move to Fairfield Center.